This guide for the iZ RADAR audio recorder will flatten the learning curve for all users. This guide is not designed as a replacement for the official manuals, available from iZ Technology. Note that this quickstart guide primarily refers to the system that Silent Way offers, the iZ RADAR V Nyquist with system software 3.5x or 3.4x. Other models in the RADAR family (the older RADAR I, II, 24 and the newer 6) and older software versions are slightly different than Silent Way's RADAR V units, but most of this will still apply. If you are using the Session Controller, its cable is long and sheathed in black plastic. One end has a single connector with 37 pins; the other end has two connectors, a 9-pin and a round connector. Connect the big 37 pin connector to the "from RADAR" jack on the back of the Session Controller. 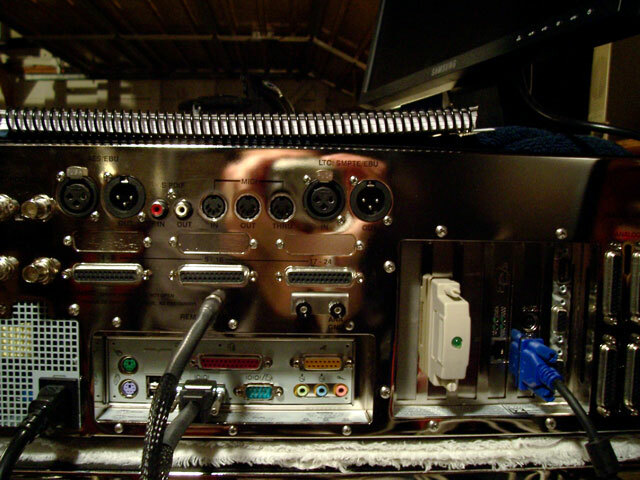 At the other end, connect the 9-pin connector to RADAR's blue "Session Controller |0|0|" jack, located next to the USB ports (not the same-shaped jack labelled "mouse"). Connect the round connector to the "Remote Power" jack, located directly above that (see photo for help). If you are using the KC-24 keyboard controller, just plug its USB cable into a USB port on the back of RADAR. 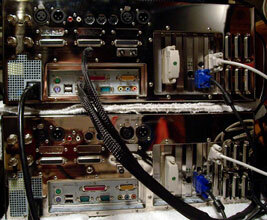 Check that the white SCSI terminator is already plugged in (green light will light on power-up). 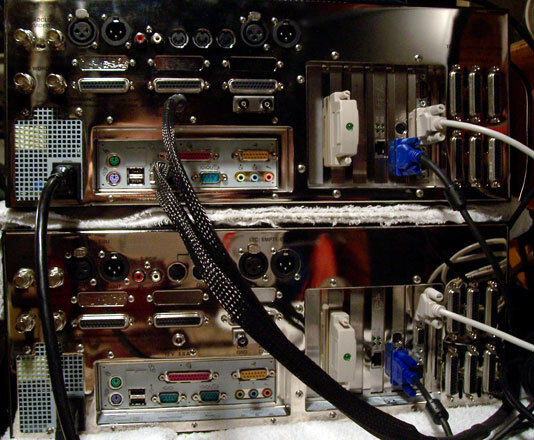 If this is a 48-track system (see picture to the right or this larger view), connect the 9-pin RADARLink cable from the "R Link Out" jack (located next to the analog i/o) on the first RADAR to the "R Link In" jack on the second RADAR. Connect the second monitor to the second RADAR. Either the Session Controller or KC-24 can control a RADARLinked system. Connect AC power cables for RADAR and monitor. Power on the monitor and the RADAR! The big logo on the front will light, and it will take a minute or so for RADAR to start up. The drive(s) will mount if the key is locked. You may see a message regarding dual disk mode, which is only possible if the two drives are identical. If not identical, the drives will both need to be reinitialized. Only reinitialize if you are sure it is ok to wipe both drives! RADAR might display this message during startup: "Record Recovery Enabled!". Hit enter to continue startup. Record Recovery should only be enabled as an added safeguard during live recordings (it's annoying if left on for mixdown or backup). Enable/disable this at "MAIN MENU-->PREFERENCES MENU-->RECORD PREFS-->RECORD RECOVERY". Most functions have a dedicated button on the Session Controller. Click on the picture at right to see a zoomable closeup of the Session Controller. Take a minute to familarize yourself with these buttons. For other functions, you'll use the menus. To navigate menus, the two most important buttons are "Menu/Prev" (this is first used to enter the main menu, after that it is used to bring you back a level) and "Enter" (which selects the current menu item). Take a moment to familiarize yourself with RADARView, the graphical interface on the monitor. Click on the picture at right to see a zoomable closeup of RADARView. You'll see many familiar items as in any computer-based DAW: waveforms, tracks, level meters, time location, locate points, etc. Note that the sample rate is listed at the top-right of RADARView. The items at the very bottom are notable too: "Rec Time" shows the remaining time based on the number of tracks currently record-armed. "Mode" describes the hard drive format ("Single 96k" is the RADAR_BWAV cluster size, NOT the sample rate), and the currently mounted drive's ID (a "0" or a "1" after the colon, or "0/1" for Dual Disk mode). When a drive mounts, the last project used on that drive will load. To create a new project, press the "NEW PROJ" button on the Session Controller (KC-24: menu item "MAIN MENU-->PROJECT-->NEW PROJECT"). To load a previous project, press the "GOTO PROJECT" button on the Session Controller (KC-24: menu item "MAIN MENU-->PROJECT-->GOTO PROJECT"). 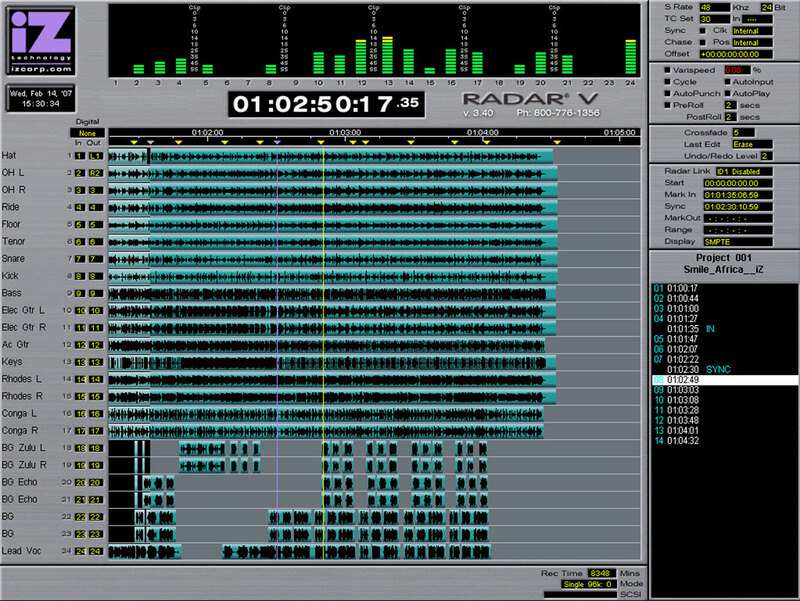 If this is a 48-track system, sync the two RADARs by pressing the "RLINK" button on the Session Controller or the letter "L". The master RADAR will show "M" and the slave machine will show that it is slave ID 1. The two monitors must show the same project number. To get to menu functions on the slave RADAR press "RLINK SOLO" or the letter "S". Arm the tracks with the numbered track arm keys (on the Session Controller press 1-48, or on the KC-24 press 1-12 and shift to get to 13-24). Check your "Rec Time" remaining, at the bottom of RADARView. Hold down "Rec" and press "Play" to start recording! When you are finished using RADAR, there are two ways to power down. The official method is to invoke MAIN MENU-->SHUT DOWN, which will step you through to using the big power switch on the front. Or, if transport is stopped (NOT recording), it's actually ok to just power it down with the power switch. If you are on location and will be moving the machine, you should unlock the drives with the key, pull them out of RADAR and carry them separately. To name tracks, press "NAME TRACKS" on the Session Controller, or go to PROJ MENU / NAME TRACK. Don't worry, it's OK to name or rename tracks during or after recording, unlike DAWs. If you press the SAFE button while RADAR is recording, all other buttons except STOP and PLAY are disabled. Press it again to re-enable all buttons. To reset peak and clip indicators on the meters, press shift-cancel. When exporting and backing up audio, RADAR treats adjacent takes as one contiguous region of audio. So, if you are recording long takes, such as a live concert, leave a few seconds of blank space between sets. When you press STOP after the first set has ended, press PLAY for a few seconds, then STOP again. (Or, locate to the next round minute.) This blank space before recording the second set ensures that the two sets are treated discretely, making post-production file management easier. RADAR can automatically switch to internal sync and continue recording after losing an external sync source. To activate this feature, go to SYNC MENU-->LOST SYNC IN REC. If you EVER see the startup message "UNSAVED DATA RECOVER IGNORE", stop immediately and read the manual and/or call iZ at 800.776.1356! ("RADAR_3.40_Manual.pdf", page 152 of the pdf, p. 144 of the printed manual). Select "RECOVER", save to the archive drive ("D") and do not record on that drive again. This entire guide is Copyright © 2008 Silent Way. Unauthorized reuse is prohibited.